Peach pie lovers! 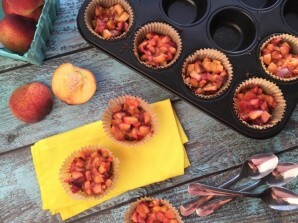 I’ve created a sweet treat for you…Mini Peach Pies that are vegan, gluten-free, grain-free & contain no added sugar. Sweet! Each mini peach pie provides gut-friendly prebiotic fiber, fat-burning MCT’s, skin-firming vitamin C and antioxidant-rich sweetness. In a food processor, pulse almond meal, coconut oil, dates, and sea salt for 10-15 seconds. Place 12 liners in a cupcake tin, evenly fill each with the crust mixture, and press down until well packed. Bake for 10 minutes until edges are browned and let cool for 5 minutes. While crusts are cooling, place peaches and arrowroot into a small saucepan and cook for 5 minutes. Place filling on top of crusts. Enjoy! What can be used in place of almond flour? I have a nut allergy so can’t use that but I really want to try this little treat! YES! This is a great little TREAT! You can use oat flour, coconut flour, or pulse raw/hulled sunflower seeds into sun flour. 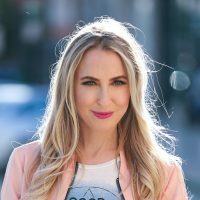 Is there an alternative to using dates? They never really give sweetness to me, yet they impart a very unsavory flavor of their own. They are also sticky and gummy and never really get incorporated, so I get stuck with yucky chunks of it in the mix. Are you using Medjool dates? If you use Deglet Noor dates they aren’t as sweet and definitely harder to incorporate. I’m such a fan of using dates because they are naturally sweet so you don’t have to use processed sugar. You can also soak the pitted dates in warm water for a few minutes & squeeze them dry to make them softer & easier to blend in. I haven’t tried the recipe with anything but dates, but you could try a tablespoon of mashed banana or honey for the 2 dates. Can this be done to make miniapple pies? YES! I love the idea of mini apple pies! Even apple ginger cranberry for the fall/winter/Thanksgiving season!